Reservations are strongly recommended and can be made over the phone by calling 907-783-5566 (877-783-5566 outside of US) or by emailing us. A credit card will be required to secure your reservation, however it will not be charged until the date of your tour pending cancellation within 48 hours and/or tour location. Participants must be 16 years of age to drive their own snowmobile. Children ages 6 – 15 years ride double with an adult. Cost is $125 for child rider. If a set of double riders are under 400lb combined, and the potential rider is between the age of 6 to 15 years of age will accrue a tour fee at $125. If a set of adult riders are under 400lb combined, are considered not suitable, physically disabled, or otherwise, we allow one confident rider to take on said single passenger accruing their additional tour fee at full price. We operate under permits issued by the US Forest Service. They determine when we can access the glaciers and icebergs. We stop running the Scenic Mountain Tour when the glaciers become available. Cost of tour is all inclusive. Your loadout includes gear, snow boots, snowsuit, helmet, goggles, gloves, transportation within the Girdwood area, snowmobile orientation with proper handling techniques with a friendly and knowledgeable guide. Guide gratuities are not included in tour price. If you like the ride, Tip the guide! †Clients are financially responsible for physical damage they may cause to the snowmobile due to careless or negligent operation. Dress in warm layers and bring whatever winter outerwear that you have. Whatever you do not have we can provide at no additional cost such as boots, snowsuits, gloves, neck-warmers, helmets, goggles etc. We will suit up at our shop in Girdwood. Before you leave we will check to be sure you have everything you need for a warm and comfortable trip! Most people who go on our tours have never been on a snowmobile before. Many people have never seen the snow. You do not have to be an experienced rider. However there is some degree of strength, coordination, and agility required to navigate your snowmobile. If you have any medical or physical conditions, please let us know when you make your reservation. Cancellation within 48 hours of your scheduled departure will be charged 50%. A cancellation on the day of the scheduled tour will be charged full price. There is no charge if the weather prevents your trip from happening. Glacier City’s guides determine weather cancellations. Usually, the glaciers, icebergs, and ice caves are accessible so long as the U.S. Forest Service opens these areas for motorized use. If so this will be our goal. If mother nature does not allow this to happen, then do not worry. Snowmobiling in the Chugach Mountains is by far the most scenic and awe-inspiring in the world. Photo ops are everywhere and you will not be disappointed! Check out the Scenic Mountain Tour views on Trip Advisor! 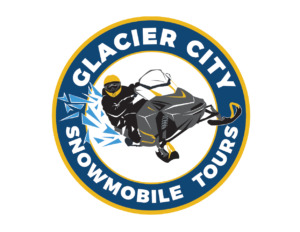 Glacier City Snowmobile Tours provides free transportation in the Girdwood Valley. Options from Anchorage include all major car rental agencies or private transportation. If you prefer private transportation, we recommend Northern Exposure Shuttle 1-907-242-5024. Cost is $85 each way for up to 6 people. There is no public transportation from Anchorage.